To view our team dynamics video and other Connect the Dots product videos, click here. Get the team dynamics that align your leaders with goals that matter. Your leaders have “the right stuff”: initiative, expertise, decisiveness, years of experience, a strong point of view and a laser-like focus on results. Yet when these talented individuals join forces on a leadership team or any high-profile team, their personal strengths don’t always mesh effectively to deliver on mission-critical goals. Too often, bad teams happen to high performers. High-performing teams depend on a shared mission, vision, and values to align their personal interests, harness their collective expertise and focus their individual efforts. They establish clear roles and responsibilities - plus a framework for making decisions and resolving conflicts. Most importantly, they commit to an environment of trust. Teamwork happens when all team members value their relationship with one another and take advantage of every learning opportunity. Hold themselves and each other accountable for the broader impact of their actions, foregoing "turf wars"
When it comes to team performance, you need all of the members believing in and working toward the same goals. With such a competitive market, you know that timing is everything and your organization can’t afford to miss any window of opportunity. Unfortunately, there are few teams today that are described as “high-performing”. Some are "spinning" or missing deadlines or producing mediocre results. Some have lost their purpose or objective and some may have just ceased to exist. And some allow individual agendas and conflicts to get in the way. If you are searching for a team dynamics solution that will unite your people and create something greater than the sum of its parts, you have come to the right place. Our team dynamics methodology improves efficiency, increases workflow, and delivers impressive results. We developed a tool called connecting teams® which drives the team building process from start to finish. Connecting teams'® unique accountability and feedback components measure and adjust the team building effort througout the process, to get your team where it needs to be. We understand what the best teams do differently. We have helped a wide variety of teams achieve increased cohesion, trust, effectiveness and bottom-line results. We get to the heart of the team's dysfuntion, facilitate the building of the solution and implement a process to keep all members on track with measureable results. 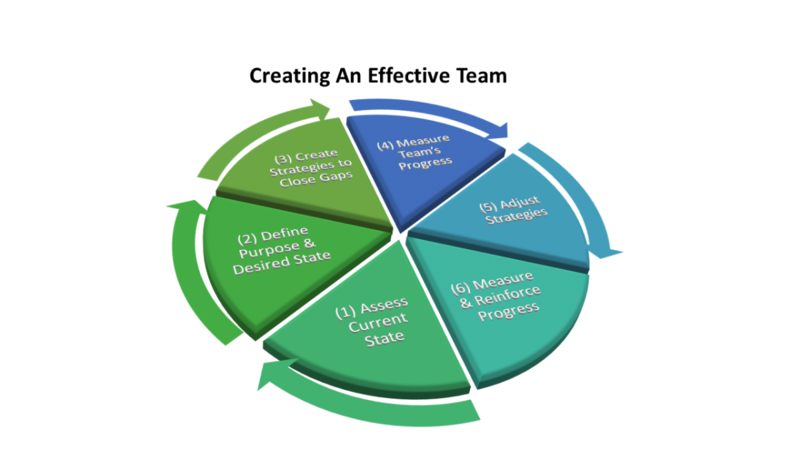 Let us work with you to determine the objectives and scope of a team engagement - and then provide process consulting, group facilitation and/or skill building to deliver the most appropriate outcomes. We want your business to succeed and we know how to make it happen. We’ve already helped other organizations build connected teams and produce the deliverables that were promised. We’d love the opportunity to discuss your team's challenges. Give us a call and we can get started on helping you create a strategy that will produce the results you need. Great teams don't just happen. Let us help you create your own “power team” that gets rave reviews. Contact us today. Click here to view our team dynamics information sheet.